The Blazin Hot 7s Slot by Bet Digital is a three reels slot with three rows and five fixed paylines. It is a typical fruit game and has a very simple design. Nevertheless, the Blazin Hot 7s has some great bonus feature and that distinguishes the game of fruit games like the Novomatic Sizzling 6. The whole design of the slot is visually accompanied by fire and flames. These and some pretty good effects make the game even better. Of course, you do not expect so much from a fruit game, but this one has an extra bonus feature like the Cherry Streak Bonus or the Spin Streak Bonus. Symbols and payouts: Well, you’re playing at a fruit slot and you’ll find orange, cherries, plums, watermelon and lemons on the reels. There is also a Triple 7 symbol, stars and a bell symbol. The low paying symbols are definitely the fruits and the BAR symbol. Here you get the 8x of your bet with a combination of three symbols. The double red 7 pays you the 100x your bet if it lands three times on the reels. The best symbol, however, is the Bonus Triple 7. Here you can win 500x your bet. Of course, if you play the Blazing Hot 7s, you will only win if you have combination with three symbols, as usual on three reels slots. Game Play and Bonus: You can play the Blazin Hots 7s from £ 0.01. The maximum is £20 and the top prize is £10.000. Before you start playing you can choose your paylines and bets. The Blazin Hot 7s Slot also has an auto play function. There is also a feature that allows you to make low paying symbols disappear. The higher you play, the fewer symbols land on your reels. With a 10x bet, for example, the plum, the orange, the lemon, the cherry, the watermelon, and the bar symbols will be removed from the reels! Cherry Streak Bonus: With the Cherry Streak Bonus you get randomly re-spins. If you get one or more Cherry symbols in this re-spins, they hold their position and you get another re-spin. The feature remains activated until no more cherry symbols land on your reels. Spin Streak Bonus: Also the spin streak bonus is triggered randomly. The difference with the Cherry Streak is that you get a re-spin for a win here. This gives you the chance to increase your already achieved profit with another winning combination. Free Spins Bonus: The Blazing 7s Slot even has a Free Spins feature. It is triggered with three Triple 7 Bonus symbols. If the symbols are on an active payline you will get an instant win and free spins. Next, select one of the displayed icons to find out how many free spins you get. 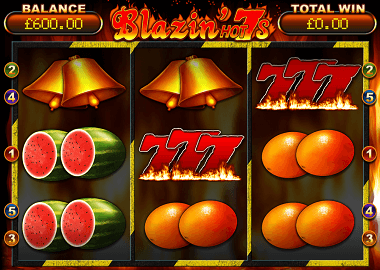 The Blazin Hot 7s slot is one of the best fruit slots for us. The game has only three reels, but still offers a lot of variety. You can play the game here with us by clicking on the Blazin 7s banner above. If you want to play the game with real money, we can offer you the Redbet Casino. Unfortunately, Bet Digital Slots are not very popular in online casinos. Therefore, the selection is correspondingly small. You can play other fruit games from ELK Studios (Electric Sam Slot), Explodiac from Gamomat or the Zoom Slot from Thunderkick.